Posted in Interactive Narrative, Uncategorized, VI Onward with Invention! New ebook-only edition revised for 2016 with over 10,000 words of new content in the form of chapter-by-chapter commentary, with new examples and useful web links illustrative of the enduring principles of design that have been validated by multiple communities of practice — from game designers to digital journalists to VR developers — since 1997 when it first appeared, and emphasizing productive design strategies for the next phase of creative innovation. The folks at TED have kindly dug up for me my 1998 talk which I still stand behind and which predicts the future well, but is also still timely. It is longer than the current crop, and more spontaneous. It falls into 4 segments and it references other talks, some of which are on the TED website but most of which are not. 1.PREAMBLE: WE NEED EVERY MEDIUM TO EXPRESS OUR HUMANITY (first 5 minutes) I take issue with Julie Taymor who spoke disparagingly of screen-based experiences, and offered the rituals of Bali dancers ( invoked again in her 20** TED Talk) as the superior paradigm for art that addresses the human condition. I also take issue with John Warnock, founder of Adobe and a rare book collector who described his meticulously prepared facsimile book series as purposely avoiding interactivity, such as searching by text, which makes it much less useful. I would still consider both positions examples of a fetishism for legacy forms of representation. (first 5 minutes). 2. ELIZA IS OUR CREATION MYTH (5:00 – 17:00) I compare the amazement at the birth of film (the legend of the Ciotat Train showing) to the amazement at the birth of procedural storytelling (the legend of Eliza at MIT), as I do in Chapter 3 ofHamlet on the Holodeck, and as I have done with my students pretty much every semester for the past 20 years. 4. WHY IS THIS IMPORTANT? (last 30 seconds) I sum up as I do in Hamlet on the Holodeck, by comparing the development of conventions of interaction with the invention of the soliloquy in Shakespeare’s time. Other references: John Warnock is the founder of Adobe and a rare book collector. At 1998 TED he presented a facsimile book series that purposely avoids interactivity, such as searching by text, which makes it much less useful. This is a good example of what I would now call legacy media fetishism. Brenda Laurel, feminist game designer and pioneer of interactive storytelling, whose talk on her wonderful but short-lived series Purple Moon, is on the TED site. Marvin Minsky, one of the seminal theorists of the field of Artificial Intelligence, who has a notorious blind spot for humanistic discourse. In the corridor between sessions Ben Shneiderman and argued with him. Minsky took the position that fictional stories were a waste of time because they were not true. Ben and I were appropriately outraged. Posted in Ch 0 Introduction, Ch 1 Design in an Evolving Medium, Ch 2 Affordances of the Medium, Design of the Unfamiliar, Interactive Narrative, What is a Medium? Where Are Gaming’s Role Models? Warren Spector is a game designer and critic who has been advocating for more expressive games for over a decade. He has just started a new column with a familiar lament: Where Are Gaming’s Role Models? Warren, who began his career expecting to be a film critic, points to a column by NY Times critic Brooks Barnes about Hollywood stars like Ben Affleck and George Clooney who persuade studios to let them make movies with serious social content. What would it take, he asks, to get the same kind of role models in the game industry? Can you imagine a game about a guy on a spiritual quest in a boat with a tiger? How about two old people struggling with the pain of love and aging? Or the story behind a raid to kill the world’s most notorious terrorist? Okay, we could probably do an okay job of that last one, though probably not the events leading up to it – do you water board that guy or not? Seriously? But you get my point. It is funny to imagine how the pitches for such imaginary games would be received by the big game companies. But we should also remember that Ben Affleck (Argo) and Katherine Bigelow (Zero Dark Thirty) had a long tradition of serious war films to point to, including classic hits like Casablanca or Bridge on the River Kwai, in which disgust for war and admiration of heroic self-sacrifice are interwoven in complex moral patterns. Ang Lee’s highly original Life of Pi exists in a number of similarly long traditions including human/beast moral fables like King Kong and ET and journey/survival films like Lifeboat or Cast Away. And of course there is no lack of French movies about Amour — including many about the amour of aging lovers — for Michael Haneke to reference. in 30 years of making games I’ve never been anything less than awestruck at the intelligence of the people playing and making what often seem like mindless entertainments. In fact, I would argue that you can’t get to serious, engaged, complex story-telling without a strong tradition of “mindless entertainments” that lots of people watch and lots of people are rewarded for creating. That is what is called a tradition of practice for the makers and a popular genre (hence watchable/playable mindlessly) for the consumers. And such formulaic traditions of practice are absolutely necessary to the creation of socially important works that actually engage and move people . 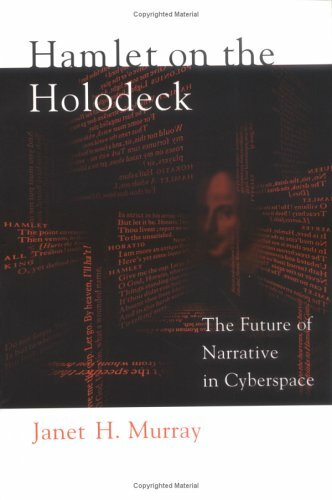 In Hamlet on the Holodeck, I pointed out that the soliloquy that Shakespeare uses in Hamlet to explore the isolation of the modern consciousness and depths of his tragic hero’s self-doubts, began as a stage device for letting the audience in on the evil intentions of the villains in the bloody, formulaic genre of the revenge play — which were pretty much the equivalent of the mind-numbing zombie games that Warren considers the nadir of current popular entertainment. No revenge plays, no soliloquys for Hamlet; no blockbuster videogames, no mechanics for expressive serious games that actually engage and move people. I share Warren’s impatience and I applaud his efforts to nurture a more “grown up” game practice. But it may be that the stealth mechanics tradition of Deus X or the survival choices of The Walking Dead ipad game will prove to be foundational to the creation of the culturally impactful games that Warren is asking for. I’m very glad that we also have non-violent, artistically captivating games like the highly successful Journey with its poetic shout mechanics and mindful play. (Maybe Jenova Chen is the hero Warren is looking for.) But even though I may not want to play kind of games Warren is making fun of, there is something to be said for the development of the conventions of interaction in a lively practice of mindless commercial entertainment.